Infinite Art Tournament: The Infinite Art Tournament, Left Bracket Third Round: Alma-Tadema v. Beckmann! The Infinite Art Tournament, Left Bracket Third Round: Alma-Tadema v. Beckmann! Sir Lawrence Alma-Tadema has shown a lot of staying power in the Tournament. After losing his opening match -- only the third in the whole dang show -- he has shown remarkable staying power in the left-hand bracket. If other people are like me, that might have to do with us getting something of a taste for the pre-Rafaelites. Or maybe not! In any event, how is he going to do against Max Beckmann, who has had almost a year to rest up after his Third Round defeat? Only one way to find out. Ladies and Gentlemen, commence your voting. Trounced Hans Baldung in the tiebreak. 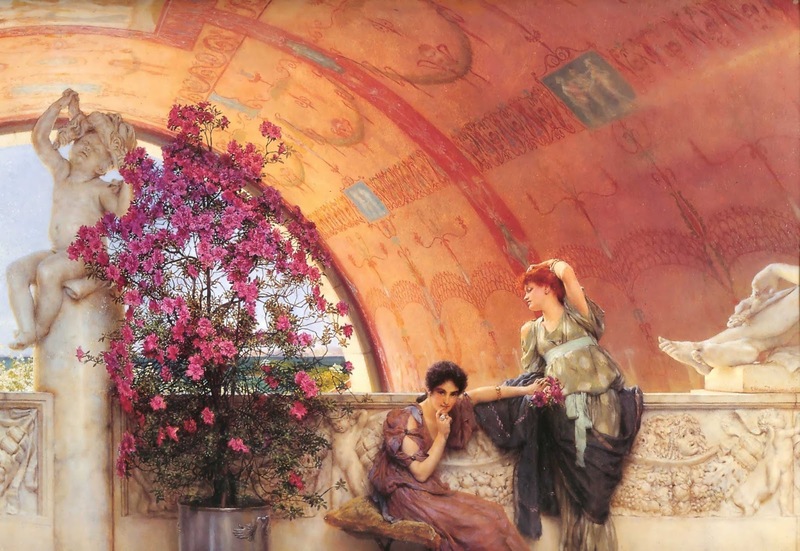 I didn't think I'd ever vote against Alma-Tadema, but I am. 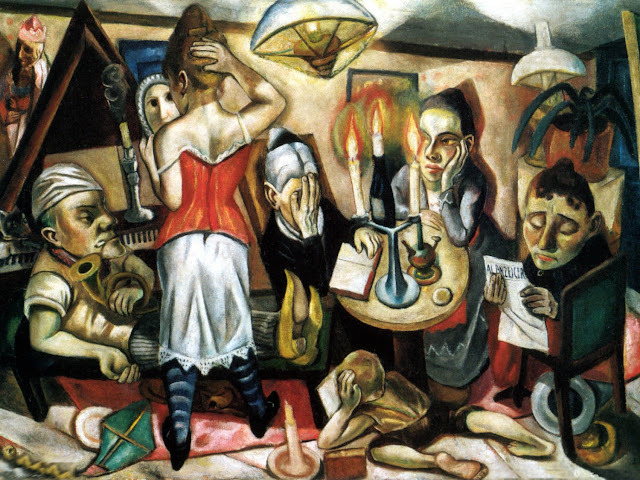 There's something very appealing about Beckmann's work this morning, an intensity that draws me more than the exquisite languor of pastel dreamscapes. I can't find anything bad to say about Beckmann, but I just cannot in good faith vote against Alma-Tadema in this matchup. There's something about these paintings that are just way compelling. Almost a toss-up for me. I'll go with creepy Beckmann-world over sunny Alma-Tadema-world. Beckmann! There's tons of curious mysterious iconographic symbolism in those triptychs, although apparently Beckmann denied it. We studied "Departure", the one with the king in a boat, in school. Sin and salvation? Response to Nazi Germany? Beckmann's own forced emigration? 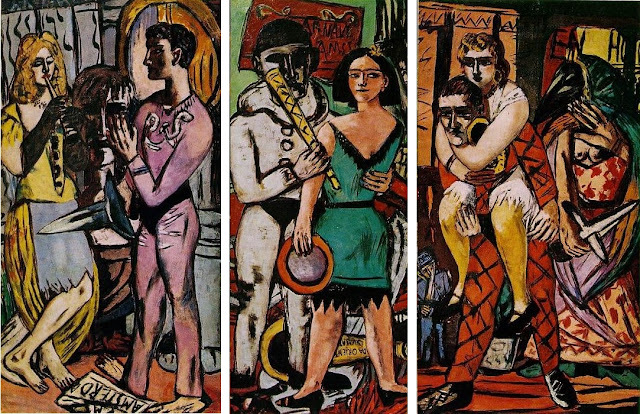 Beckmann denied it meant anything in particular. Hmm, okaaay. Here's an email vote for Beckmann -- "Max is my man!" Oh hey look, I missed this one. 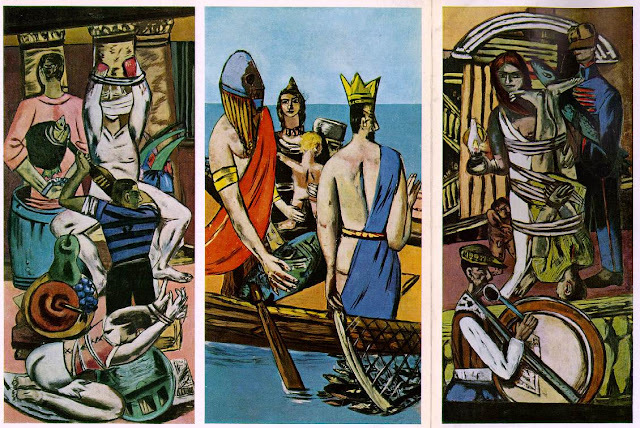 Beckmann and Alma-Tadema have both grown on me a lot from low starting points. 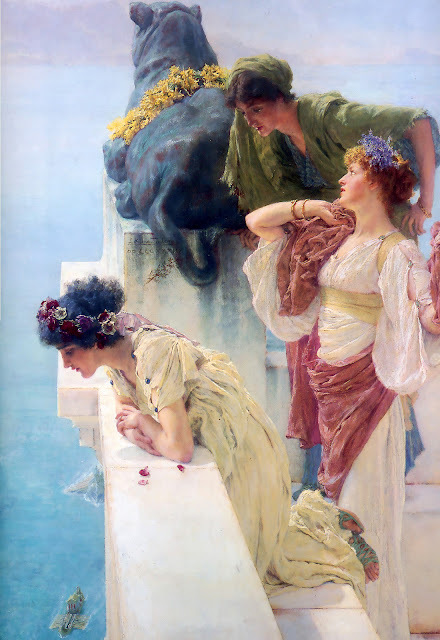 Alma-Tadema is fruitier than a box of tangerines, but I'm getting confident enough in my art history that I'm not so embarrassed by sentiment any more. 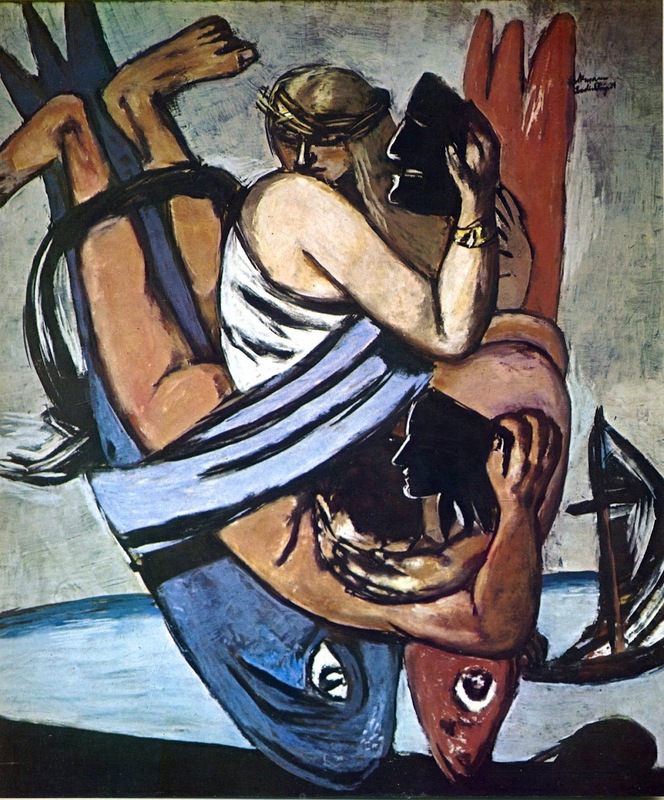 Beckmann reminds me of a little bit of Tintin, except OMG WHAT IS CAPTAIN HADDOCK DOING TO THAT LADY? And time's up: Beckmann will advance to the Semi-Finals, and Alma-Tadema will have to feel pretty good about going 3-2-1 in a Tournament where most people hadn't heard of him coming in. The score was 7-5. Thanks for voting!